"Give. Us. Something. Here!" -- The core Obama campaign slogan. Can we get us something from the government? Yes we can! Can we get us more from the government than we've gotten already? Yes we can! Can we get us more of the same service that's given the country the USPS, the Social Security System, Medicare, and a tax code so complex it needs a semi-truck just to move it around town? Yes we can! When I worked in book publishing in Boston, there was an old woman that haunted the sidewalk outside my office on Park Street. She stood there in all weathers working at her job. Her job was to ask every person that passed her on this busy downtown street, "Spare a quarter?" She got a quarter out of about every fifth person. We once estimated she made about $75 a day, tax free. That worked out to a take homeless of $18,750 a year in 1983. Not bad when you considered that she had zero overhead. Imagine that street worker transported to 2009 and endowed with the power not to ask but to demand a quarter from everybody who passed her to and from their way to work. This "on demand begging" boosts her up to $93,750 a year. In 1983 dollars. That makes her line of work look less like begging and more like a career. And that's what the Obama promises hold. When a private citizen demands money from you it's called robbery or extortion. When the government does it, it is a tax. And lurking in the dark center of the Obama promise penumbra is a whole new class of taxes -- "fairness taxes." Taxes to make everything, once and for all, "fair." 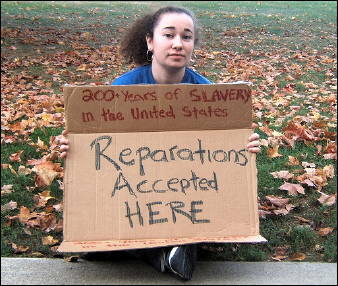 And once you get fairness taxes in, can reparations be far behind? Not at all. So far criticisms of the Obama promise penumbra cite and stall at the feared "rollback" of the tax cuts. But to my mind that's only the beginning, the nose of the brontosaurus. What's coming down the road right after the rollback is going to be a scary circus clown car stuffed to the grill with funny little fees, small little appropriations, wee adjustments, and a mess of other miniscule mischief aimed at making everything "fair." No single item will be large, but in aggregate your pocket will be plucked. Fairly. "Fairness taxes" are the logical ideological extension of "government grants." But that does not mean that they will supplant such grants. Not at all. "Fairness taxes" mean the empowerment of a thousand different victim and interest groups who have all been slighted and who will all be dipping their hands into your pockets all day, every day. Each hand will take out just a quarter. You can spare a quarter, can't you? You've got jars of them around the house, don't you? But can you spare the hundredth quarter? Quarter number 100,000? You will. In the same spirit of giving you have when you pay your taxes. That's what happens when people who hope for spare change get to make their wishes into law. That's what happens when the "Spare a quarter?" crowd elects "Give. Us. Something. Here!" To quote another bromide salesman at a tent revival, "Dig deep brothers and sisters. For the good work." Somebody needs to commission a study on how many of these panhandlers there are from one year to the next. And if the numbers ever dwindle, we should bring a bunch of experts on to the morning 6 o'clock news or the evening 10 o'clock news to wring their hands and give us some helpful advice about everyday things we can do to bring 'em back again. 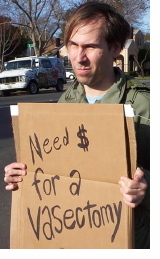 Perhaps we could establish a new government program to educate people about how a career in panhandling might be right for them. Some outreach to draw more panhandlers to certain street corners where they're in short supply. Maybe we could offer the prospective panhandlers some tax brea-- oh, wait, nevermind on that one. The always perspicacious, but pseudonymous Spengler dissects Ms. Obama in this weeks column. Barack Obama, I argued, evinces a preternatural sangfroid, for he is in America but not of it, a Third World anthropologist profiling Americans. But his wife's anger at America will out, for it is a profound rage amplified by guilt. Michelle Obama, Hillary Clinton, Lady Macbeth? I am accepting reparations from the descendants of those who oppressed my ancestors in the Austro-Hungarian Empire. I remember that woman on Park Street! I worked at the State House at the time. Was walking up Park back to work after lunch. She asked me if I had a quarter. I told her I only had bills. Her classic response? "I can make change." I had to admire that kind of entrepreneurship - gave her 4 bits. So, folks are complaining about Hillary? Are they sick enough of the Clintons to want the Obamas? Oh, golly, she and hubby had to pay back loans for going to Harvard and Princeton (or wherever)? How sad. Also how sad that our I-pod/cable TV/multiple-car family/McMansion lives have been so MISERABLE for decades now! Can't we please, PLEASE go back to the golden age of Levittown, black & white TVs and rotary phones? At least back then we had jobs for life and a pension . . . OOOPS! Unless you were "colored" that is. Heaven forfend if in the mystical, mythical golden age of "fairness" that a Michelle Obama, a woman -- and a black one at that -- should even dream of being a hospital administrator. Oh, and by the way, Senator Obama DOES have one legislative accomplishment: a bill that commits .07 percent of U.S. GNP to "foreign aid." Supposedly, the imbeciles in both House passed it. Do the math: we have a $14 Trillion GNP, how much is .07 percent (as in seven tenths of one percent)? How many palaces, armored cars and Swiss bank accounts does that buy the likely (and often sole) recipients of that enormous largesse?